The cucumber is a creeping vine that roots in the ground and grows up trellises or other supporting frames, wrapping around supports with thin, spiralling tendrils. The plant has large leaves that form a canopy over the fruit. The fruit of the cucumber is roughly cylindrical, elongated with tapered ends, and may be as large as 60 cm long and 10 cm in diameter. 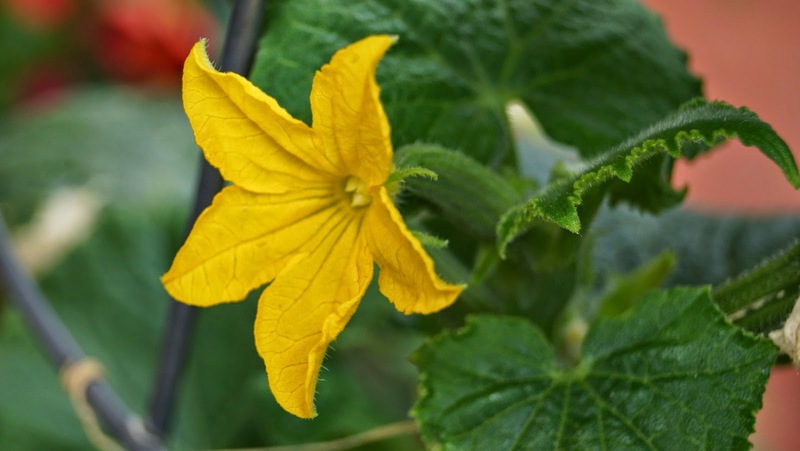 Having an enclosed seed and developing from a flower, botanically speaking, cucumbers are classified as accessory fruits. Much like tomatoes and squash they are often also perceived, prepared and eaten as vegetables. Cucumbers are usually more than 90% water. Wish we had more of the yellow fruit ones available, like I remember from my childhood. Nice healthy looking plant you have there, Nick! I can't wait for backyard veggie time for us, coming up soon. A great color, dear Nick! Two beauties in one - Lovely flower and delicious cucumber! Have a wonderful weekend and thanks for hosting. that's very interesting, love the blossom of cucumber! I have a love/hate relationship with the cucumber. I love to eat them but struggle to grow them. Bligh usually gets them early on. Very pretty! Thank you for hosting and have a nice weekend. Nice flower on the cucumber!